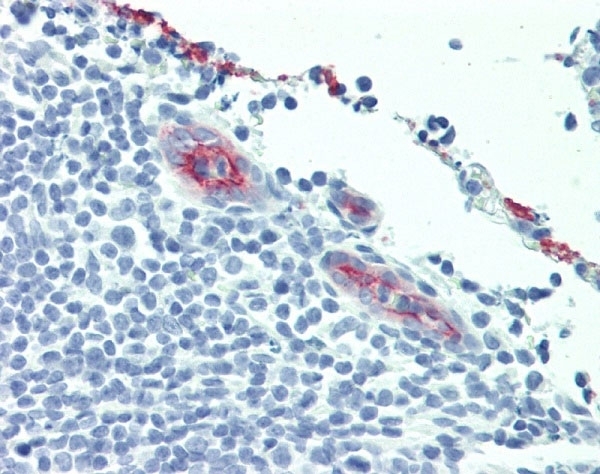 FFPE human tonsil vessel stained with Mouse Anti-Human CD62P (MCA796GA), biotinylated Anti-Mouse IgG and Streptavidin Alkaline Phosphatase (red). Nuclei were counterstained with hematoxylin. 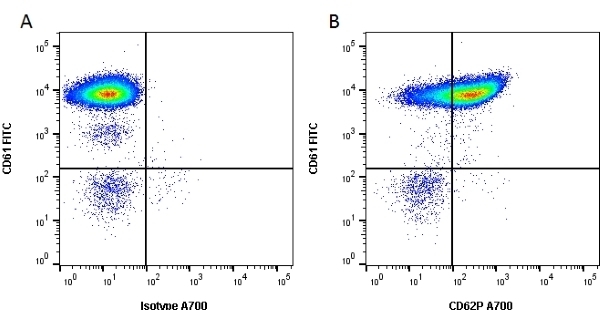 CD62P plays an important role in adhesive processes between leucocytes and endothelial cells. CD62P is a component of the platelet alpha granule and is rapidly translocated to the plasma membrane upon activation (Stenberg et al. 1985). 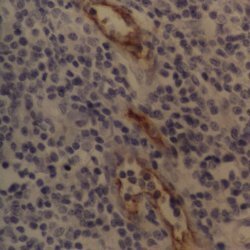 * We recommend that this antibody be carefully titred against any previous batches to enable correct comparisons to be made with earlier results. The suggested working range lies between neat and 1/10. Dunlop, L.C. et al. (1992) Characterization of GMP-140 (P-selectin) as a circulating plasma protein. J Exp Med. 175 (4): 1147-50. Skinner, M.P. et al. (1989) Characterization of human platelet GMP-140 as a heparin-binding protein. Biochem Biophys Res Commun. 164 (3): 1373-9. Skinner, M.P. et al. (1991) GMP-140 binding to neutrophils is inhibited by sulfated glycans. J Biol Chem. 266 (9): 5371-4. Bevilacqua, M.P. & Nelson, R.M. (1993) Selectins. J Clin Invest. 91 (2): 379-87. Roos-Engstrand, E. et al. (2005) Increased expression of p38 MAPK in human bronchial epithelium after lipopolysaccharide exposure. Eur Respir J. 25 (5): 797-803. Kornerup, K.N. et al. (2010) Circulating platelet-neutrophil complexes are important for subsequent neutrophil activation and migration. J Appl Physiol. 109: 758-67. Wassmer, S.C. at al. (2008) Platelet-induced clumping of Plasmodium falciparum-infected erythrocytes from Malawian patients with cerebral malaria-possible modulation in vivo by thrombocytopenia. J Infect Dis. 197: 72-8. Theoret, J.F. et al. (2001) P-selectin antagonism with recombinant p-selectin glycoprotein ligand-1 (rPSGL-Ig) inhibits circulating activated platelet binding to neutrophils induced by damaged arterial surfaces. Turner, C.P. et al. (2003) The role of P-selectin in the immune destruction of platelets. Br J Haematol. 121: 623-31.
van Nispen tot Pannerden, H. et al. (2010) The platelet interior revisited: electron tomography reveals tubular alpha-granule subtypes. Knipe, L. et al. (2010) A revised model for the secretion of tPA and cytokines from cultured endothelial cells. Kitaya, K. & Yasuo, T. (2010) Aberrant expression of selectin E, CXCL1, and CXCL13 in chronic endometritis. Mod Pathol. 23 (8): 1136-46. Xiong, G.M. et al. (2015) Imparting electroactivity to polycaprolactone fibers with heparin-doped polypyrrole: Modulation of hemocompatibility and inflammatory responses. Liao, Y. et al. (2017) Tailoring of TiO2 films by H2SO4 treatment and UV irradiation to improve anticoagulant ability and endothelial cell compatibility. Colloids Surf B Biointerfaces. 155: 314-22.